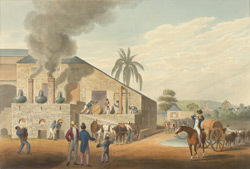 This aquatint by William Clark is an illustration of the exterior of the curing house and stills on Weatherill's plantation in Antigua. It is taken from a work by William Clark in which he depicts and describes the different processes involved in sugar cultivation. After boiling the sugar was cooled and then packed into ceramic containers shaped like flowerpots with a hole in the bottom. The molasses or syrup would drain out of the pots and could then be taken to the distillery to make rum. After 5 or 6 weeks in the curing house the sugar had dried and hardened into pot shaped loaves which could then be transported to England.